Handmade, locally blown glass art. More space, more goods, more customers – moving from Young Avenue to South Cooper Street has paid off for the former Young Avenue Glassworks. Having been renamed Cooper-Young Glassworks & Gifts, the shop moved to its new address, 906 South Cooper Street in December. 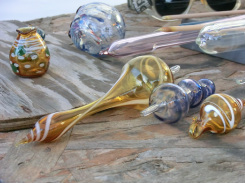 “As soon as we learned this location would become available, the decision was clear”, says Ashly Snyder, glass artist and owner of Cooper-Young Glassworks & Gifts. To celebrate the new location, the owners of Cooper-Young Glassworks held a glassblowing demonstration. Miriam Hegner covers Development/ Residential/ Business for MicroMemphis. Follow her on twitter ( @MiriamHegner ).